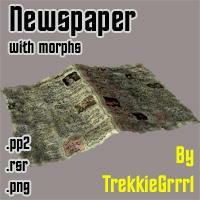 A newspaper with morphs to crumble and fold it. Just what I needed to add some realism to a street scene. Of course I tidied up afterwards. Thank you for this! Very useful little item. Thank you. cool exactly what I was looking for. Useful thing. ThanQ. Love your work. Dead news flying down the street in the wind. eileen123 (10 years ago) Inappropriate? Webtigress (10 years ago) Inappropriate? Looking like a minor detail, but sometimes very useful. Thanks for sharing.